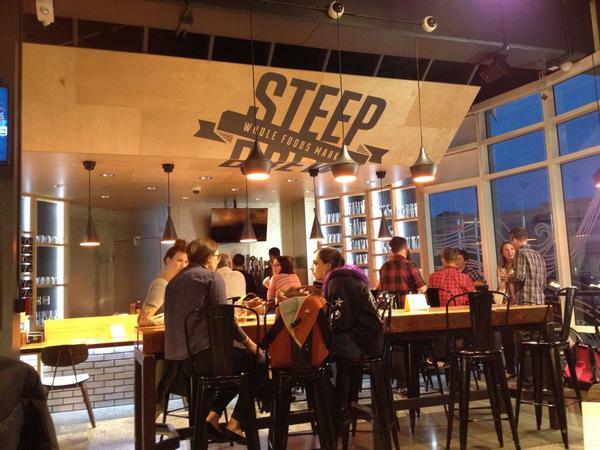 The second Steep Brew tap room in San Francisco is inside the Whole Foods Market in the SOMA neighborhood, South of Market on Fourth Street near the freeway. You’ll find 15 taps of craft beer, a thoughtfully-curated selection of bottled beers with a $1 corkage, plus a few wines. You can purchase and carry in food from the grocery store, which includes an extensive hot and salad bar. Steep Brew features both small local breweries and interesting special releases from afar. This venue is one in a series of “taps at a grocery store” model taprooms created by Whole Foods in Northern California, and more breweries are having special events in these locations as WF establishes that beer matters in these stores. Two TVs provide local sports coverage or sometimes amusing old films. Extras: During baseball season, walking between BART and the ballpark, this makes a nice stop. If it’s not a game day, a loop trip including 21st Amendment and Thirsty Bear makes a good urban beer hike. Exit the BART station on the south side of Market Street. Walk northeast (toward the distant pointy Ferry Building tower) to 4th Street. Cross 4th and turn right. Continue down 4th Street about 0.6 of a mile until you see Whole Foods Market. Steep Brew is on the Harrison Street corner of the building. You can enter the taproom from the street or go through the store to shop before having a beer.